'Minibrain' Study Yields Insights Into Roots Of Autism And Epilepsy : Shots - Health News Experiments with small clusters of networked brain cells are helping scientists see how real brains develop normally, and what goes awry when cells have trouble making connections. Scientists placed two clusters of cultured forebrain cells side by side (each cluster the size of a head of a pin). 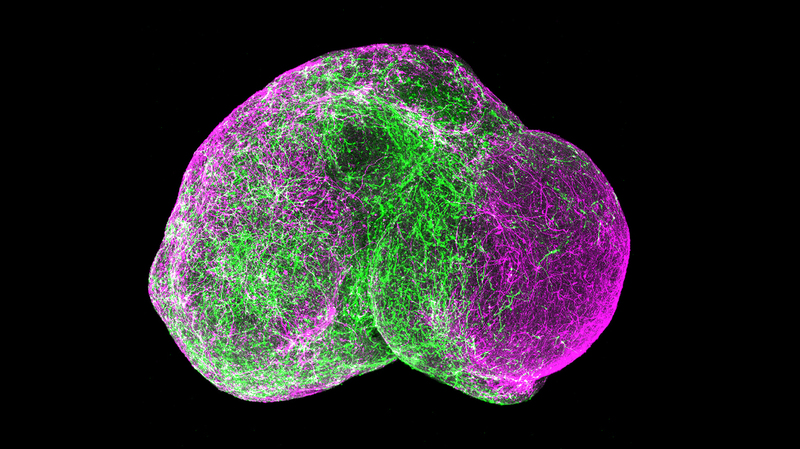 Within days, the "minibrains" had fused and particular neurons (in green) migrated from the left side to the right side, as subsets of cells do in a real brain. An experiment using these cell clusters — which are only about the size of the head of a pin — found that a genetic mutation associated with both autism and epilepsy kept developing cells from migrating normally from one cluster of brain cells to another, researchers report in the journal Nature. "They were sort of left behind," says Dr. Sergiu Pasca, an assistant professor of psychiatry and behavioral sciences at Stanford. And that type of delay could be enough to disrupt the precise timing required for an actual brain to develop normally, he says. The clusters — often called minibrains, organoids or spheroids — are created by transforming skin cells from a person into neural stem cells. These stem cells can then grow into structures like those found in the brain and even form networks of communicating cells. Brain organoids cannot grow beyond a few millimeters in size or perform the functions of a complete brain. But they give scientists a way to study how parts of the brain develop during pregnancy. "One can really understand both a process of normal human brain development, which we frankly don't understand very well, [and] also what goes wrong in the brain of patients affected by diseases," says Paola Arlotta, a professor of stem cell and regenerative biology at Harvard who was not involved in the cell migration study. Arlotta is an author of a second paper in Nature about creating a wide variety of brain cells in brain organoids. Pasca's team began experimenting with organoids in an effort to learn more about brain disorders that begin long before birth. Animal brains are of limited use in this regard because they don't develop the way human brains do. And traditional brain cell cultures, which grow as a two-dimensional layer in a dish, don't develop the sort of networks and connections that are thought to go awry in disorders like autism, epilepsy and schizophrenia. "So the question was really, can we capture in a dish more of these elaborate processes that are underlying brain development and brain function," Pasca says. He was especially interested in a critical process that occurs when cells from deep in the brain migrate to areas nearer the surface. This usually happens during the second and third trimesters of pregnancy. So Pasca's team set out to replicate this migration in a petri dish. They grew two types of clusters, representing both deep and surface areas of the forebrain. Then they placed deep clusters next to surface clusters to see whether cells would start migrating. Pasca says the cells did migrate, in a surprising way. "They don't just simply crawl, but they actually jump," he says. "So they look for a few hours in the direction in which they want to move, they sort of decide on what they want to do, and then suddenly they make a jump." Pasca suspected this migration process might be disrupted by a genetic disorder called Timothy syndrome, which can cause a form of autism and epilepsy. So he repeated the experiment, using stem cells derived from the skin cells of a person who had Timothy syndrome. And sure enough, the cells carrying the genetic mutation didn't jump as far as healthy cells did. "They moved inefficiently," Pasca says. Next Pasca wondered if there might be some way to fix the migration problem. He thought there might be, because Timothy syndrome causes cells to let in too much calcium. And he knew that several existing blood pressure drugs work by blocking calcium from entering cells. So the team tried adding one of these calcium blockers to the petri dish containing clusters of brain cells that weren't migrating normally. And it worked. "If you do treat the cultures with this calcium blocker, you can actually restore the migration of cells in a dish," Pasca says. Fixing the problem in a developing baby wouldn't be that simple, he says. But the experiment offers a powerful example of how brain organoids offer a way to not only see what's going wrong, but try drugs that might fix the problem. Still, to realize their full potential, brain organoids need to get better, Arlotta says. This means finding ways to keep the cell clusters alive longer and allowing them to form more of the types of brain cells that are found in a mature brain. Arlotta's team has developed techniques that allow brain cell clusters to continue growing and developing in a dish for many months. And what's remarkable, she says, is that over time the clusters automatically begin creating structures and networks like those in a developing brain. "Using their own information from their genome, the cells can self-assemble and they can decide to become a variety of different cell types than you normally find," she says. In one experiment, a brain organoid produced nearly all the cell types found in the mature retina, Arlotta says. And tests showed that some of these retinal cells even responded to light.